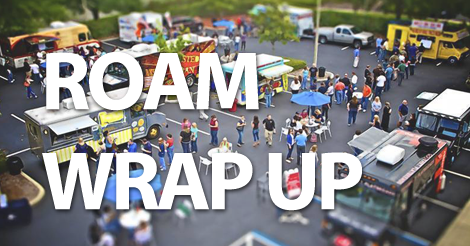 We’d like to welcome food truck champion, Brett Lindenberg from FoodTruckEmpire.com, with his take on the Roam Mobile Food Conference. Brett formed Food Truck Empire to inspire truckers and help them run a more profitable mobile food business. Weren’t able to fly to Las Vegas to attend the ROAM Mobile Food Conference 2016 this year? While no simple blog post can replace the experience of attending a live event, I’ve got my notes from the event handy and I’m ready to drop some of the biggest knowledge bombs delivered from the ROAM stage. Let’s do this! The event kicked off on Saturday morning with a presentation titled “Working With Your City: Madison Wisconsin Case Study” from Warren Hansen, Street Vending Coordinator in the City of Madison. In this presentation, Hansen articulated some of the nuances and challenges of operating a food truck in certain areas. Hansen’s presentation also highlighted the importance of finding out the local rules and regulations of a food cart within the city you plan to operate in before investing. One of the critical takeaways from this presentation was that you need to reach out to and work with individuals that manage the food cart rules and regulations in your area. For example, the City of Madison has some very strict size requirements for food carts. The maximum size for a food cart is 10 feet by 12 feet and no taller than 10 feet in height. Also, food trucks (only trailers) are allowed to vend within this city. This is a critical legal point to understand before investing tens of thousands into a mobile food vehicle. The other takeaway from this presentation is that you shouldn’t view your health department or government officials as adversaries in your business journey. Most inspectors and government officials want you to succeed and are more than willing to work with you to help get your business off the ground. So be friendly with local inspectors and others. They are there to help you in your business venture and plan. Food truck owners are extremely giving and purpose driven individuals. This became extremely evident at the ROAM Mobile Food Conference. But there is also a challenge with giving everything away. Food trucks are businesses, and as a result must be profitable or will eventually burnout. Willy Fontanez of the Oklahoma Christian Food Truck Coalition shared his story on how he was able to build charitable work and a larger purpose into his food truck business. As Fontanez described in his presentation, he discovered his greater purpose by accident. One day while out vending, Fontanez spotted a homeless person walking nearby his vehicle. He reached out to the man and asked if he would like something to eat. The man replied by saying that he didn’t have any money. Fontanez gave back by offering him anything on the menu. After that life changing experience, Fontanez continued to give away meals to those in need, and never turned folks away. But, he also made a little tweak in how he charged for meals. Fontanez allowed customers to pay an extra $5 to Pay It Forward and buy a meal for someone else. Making this change allowed Fontanez to make a difference in his business, help more people, and also generated a ton of press in the process. Another huge topic of the event was around investing in the right food truck for your business. Bob Pierson of MR-Trailers.com, a custom food truck manufacturer based in Florida, outlined exactly what to look for in a new mobile food unit and also outlined the questions that you should ask a custom builder before getting started. Some of the key tips in this panel, including questions you should ask a builder. Do you provide support after the sale? Overall, the ROAM Mobile Food Conference was an incredible event. Can’t wait for #ROAM2017!